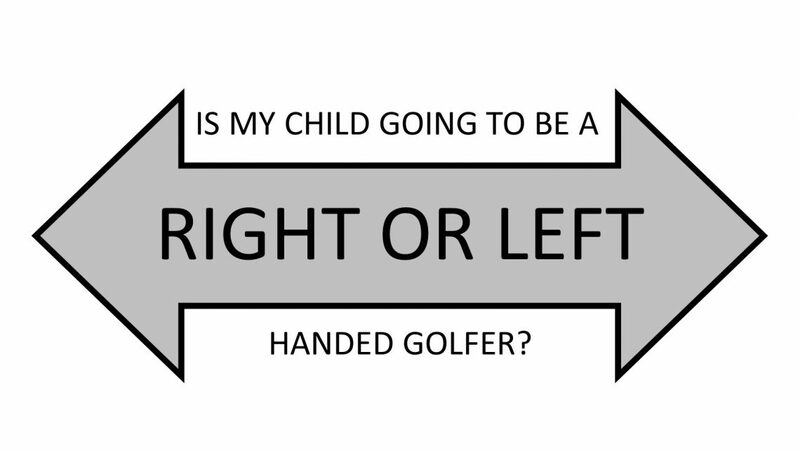 What hand is your junior golfer? Home / Golf Lessons, Tips & Instruction / Right or Left Handed? It is a common sight over the summer holidays to see both parents and grandparents bringing their young children to the course, in an effort to expose them to the sport they themselves are so passionate about. It is often done in a very casual fashion – as it should be – with the youngster being given two clubs, a putter and an iron. They follow in tow to the driving range and putting greens, and on occasion will even ride the course on the power cart, stepping off to make an occasional swing. Are they going to be right or left handed? Unfortunately there is absolutely no definitive way to determine which hand they are going to be, as there has been no direct link or correlation established to any other sport or activity. They have done numerous studies and all have been fruitless. At the end of it all, the only definitive thing they have gleaned from studies is that it doesn’t matter what hand they use to swing a bat, shoot a puck, swing a racket, throw a ball or write a letter. The last stats I read a number of years ago showed the Canadian golf population to be roughly 25 per cent left handed. Based on this, the logical guess is to start right handed and more often than not you will be correct. The strongest consideration should be given to comfort; allow them to mess around and explore. I suggested young children start with a two-sided putter and you can then let them bounce back and forth until they make up their mind. They will eventually find comfort on one side of the ball or the other and you can follow their lead. You need to look for the side of the ball they are standing on most, not the position of their hands. It is common to see them swing right handed with a left handed grip, or vice versa. The grip is an adult concept which they do not comprehend so it is not an indication of right or left handed preference, so pay attention only to the side of the ball they stand on. Why do the grip it backwards? In some cases the cross handed strategy is done to accommodate weak wrists or clubs which are too heavy, so do not panic. Slowly nurture their hands to the right position over time and when doing so, allow them to do it split grip style (as in a hockey or lacrosse stick) if they so desire. Split gripping is another way children can offset the heavy club or weak wrist issue. Over time your goal is to then slowly decrease the amount of gap between the hands. The key here is to let them be in full control of the side they stand on and don’t interfere with them at all if they look confused. Comfort and habit will form very quickly once they decide what hand they want to be. Enjoy mentoring them this summer and watching them grow to appreciate this great game we all love so much.